This letter was written by 20 year-old Pvt. 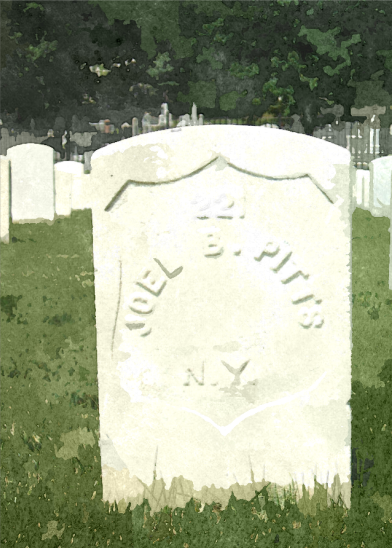 Joel B. Pitts (1843-1865) of Company H, 7th New York Heavy Artillery. Joel was the oldest son of Isaac Boyce Pitts (1813-1894) and Emma Conkling (1818-1869) of Watervliet, Albany County, New York. He wrote the letter only six weeks after his enlistment on 1 October 1863 at Albany, New York. 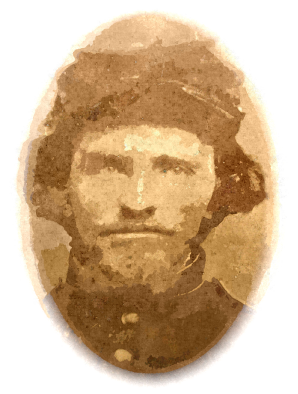 He was wounded on 3 June 1864 in the right arm and left side at the Battle of Cold Harbor but survived only to die of typhoid fever in a Baltimore Hospital on 13 April 1865. He is buried at the Loudon Park National Cemetery in Baltimore. The letter was written from Fort Reno (originally named Fort Pennsylvania) on the highest elevation north of Washington D. C. The fort was originally constructed in the fall of 1861 and was quite small. By the time that Pvt. Pitts was quartered there, however, it had been enlarged and strengthened and was considered the stronghold of the northern defenses of the capital. Pvt. Pitts wrote the letter to Sarah Mulford Wade (1844-1920). 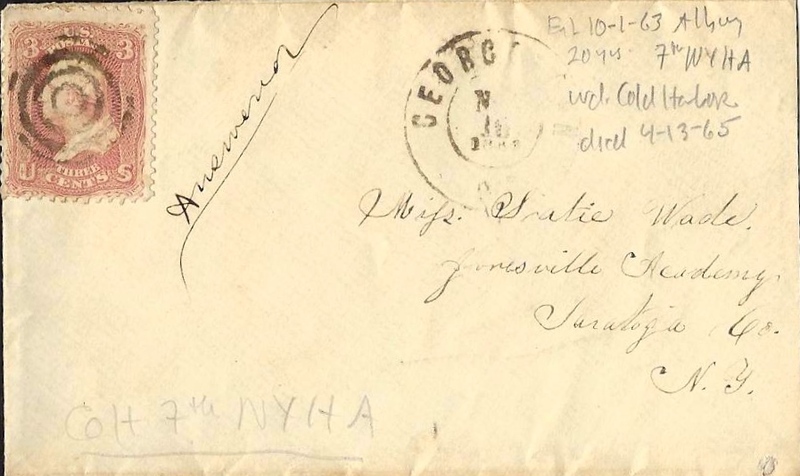 We learn from the envelope that Sarah was attending the Jonesville Academy in the town of Clifton Park, New York. The school was formally opened as an academic institution in 1841 and flourished until about 1860 when it began to crumble financially. It was coeducational and prepared students for business, teaching, or a higher course of collegiate studies. Sarah M. Wade was the daughter of Dr. Ezekiel Mulford Wade (1816-1886) and Sarah Ann Saunders (1819-1850) of Watervliet, Albany County, New York. Sarah married Visscher Lansing (18xx-1926) in 1876. 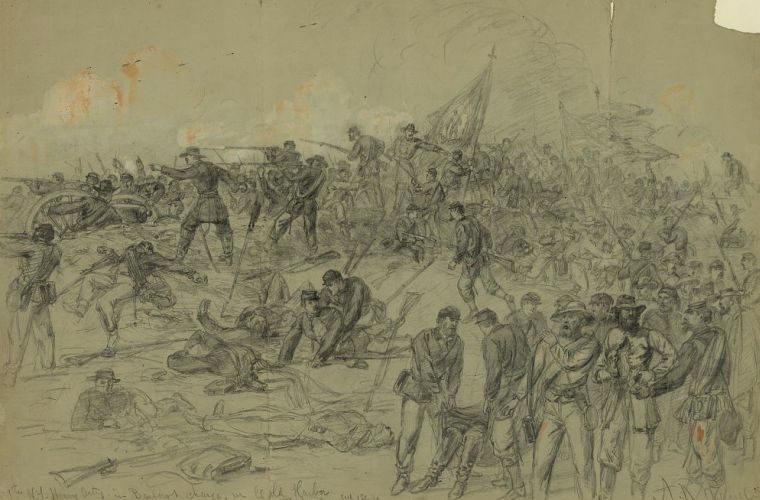 This sketch by artist Alfred Waud captures the 7th NYHA breakthrough at Edgar’s Salient during the Battle of Cold Harbor on 3 June 1864. Pvt. Pitts was wounded in the right arm and left side. Two days ago when I received a letter from James, I was surprised to find a piece of paper directed to my unworthy self. On opening it, I saw that it purported to come from my sister and concluded it must be “Sarah” although it had a foreign signature. I had forgotten that piece of nonsense you spoke of and was very much pleased that you should condescend to write to a poor soldier boy. It certainly is “pleasant to be remembered” as you say and I enjoyed reading your note as much as I would eating my dinner. This is a droll comparison but nevertheless a good one. Last night was very dark and rainy and this morning it still continues so I have lots of time to write nonsense for the benefit of sister Sarah. The way we pass Sunday is somewhat different from what we were accustomed to that an account would not be uninteresting to you. In the morning as soon as it is light, we have to turn out for roll call, after which we get out breakfast. After that is over, there is a great stir getting ready for inspection. Soon the drum beats when we have to put on knapsacks, cartridge and cap boxes, belt, brasses, scales, haversack, cape, canteen bayonet scabbard, gun, bayonet, and the rest of our contraptions and “fall in” to be inspected to see if they are in good order. In the afternoon if the weather is fair, we have dress parade when the chaplain preaches a bit of a sermon. The rest of the time we have to ourselves. If it hadn’t “very peculiar” I don’t know what is for that wedding you told me of is the third one I have heard of since I came here. I guess all the men are going to get married to escape the draft. The place where I am writing is not roosting on a pole but the next thing to it, viz: up in the third story of the barracks or on top of the top bunk where I am nearly as comfortable as I would be sitting by the fire at home. My “Southern residence” so far suits me very well but don’t know how long it will last. If you should ever go on a journey with a “kitty pony” to that cottage (I forget the name of it) with a crazy youth, be so kind as to let me know. You are pardonable for penning that note to me and you can rest assured that while I’m in the land of cotton, old times at Pultney are not forgotten. Edward is in good health and spirits. Now sister, if you have had your photographs taken, please remember that I would like to have one. I wish you a pleasant and profitable time. This entry was posted on Wednesday, October 8th, 2014 at 1:50 pm	and posted in Uncategorized. You can follow any responses to this entry through the RSS 2.0 feed. « 1863-4: Josephine Lavina Gordon to William A. Gordon, Jr.